he Society was founded in May 1952 by Mr. Shigeie Izumi in Odate Town at the time. This was a treatment of indigenous dogs (Odate dog) passed down from ancient times to this district, feeling racial blood turbidity due to the battle dogs becoming irritated, and being anxious about becoming hybridized It is said. It seems that the systematic operation was not easy, but from around 1945 it gradually got into orbit, the dog registration was first carried out, and in the same year the Akita dog standard was also enacted and an exhibition was held It was temporarily suspended by war though it came to be. After the war it revived rapidly, from 1949 it was held an exhibition, from 1949 the bulletin “Akita dog” was issued, transition to an incorporated corporation organization in May 1952, Moved to public corporation foundation in April, it is operated. Beginning in the Showa 24 and 5 around the country, the establishment of branches and general branches began, and now the total branch is located in Tohoku Hokkaido, Kanto, Kanto Central, Tokai Hokuriku, Kansai, Shikoku, Chugoku Setouchi, Kyushu, There are more than 50 branches in the subordinate, overseas there are clubs in the United States, Chugoku, Taiwan, Russia and Europe. Then, not only of the headquarters exhibition in the spring and autumn but also the general branch exhibition, each branch holds one or two exhibitions a year or more, and in addition to that it holds an ornamental meeting and a research group from time to time. 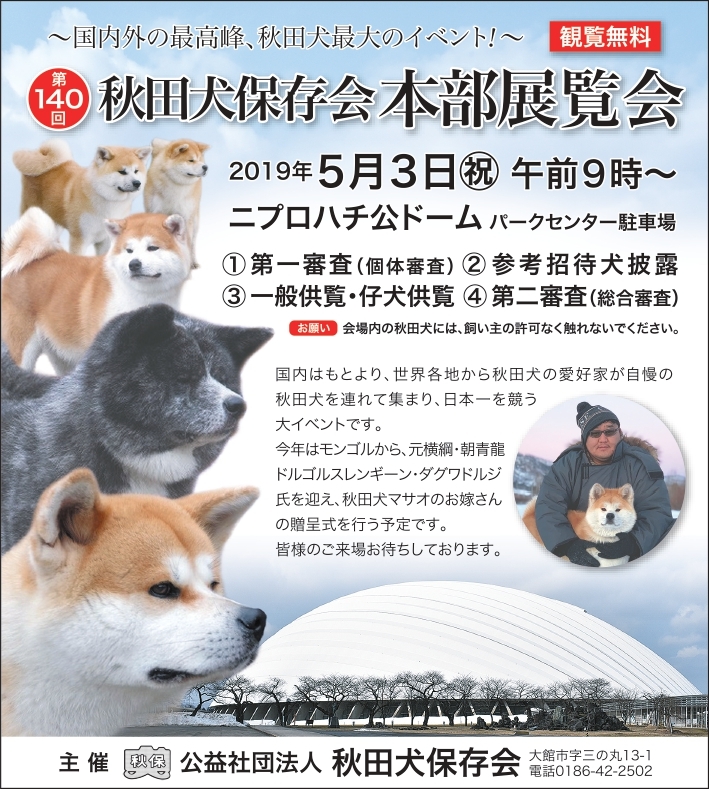 In addition, this association hit the 50th anniversary of the founding of the Showa 52nd, and the Akita dog hall was established in commemoration of it. The first floor is the headquarters office, the second floor is the conference room, the third floor is the Akita dog Museum room, and it is highly valued as the only museum group in our dogs group.